Below is a list of our current documents, they include our leaflet and membership form. Learn a little more about us. 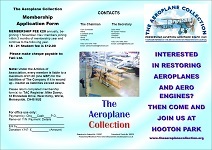 Fancy joining us and restoring some part of or aviation heritage and learning more about it? Below are some of our past monthly newsletters.